THANKFUL. This word that has crossed my mind frequently since returning home from my visit to Ghana. The joy that radiates from Ghanaians conceals the hardships that most of them face on a daily basis. Little access to clean water, children working the streets, and the piles of waste along the road were my foremost concerns as we traveled through the different towns from Accra to Kumasi. It is hard to comprehend how societies live in these conditions, yet be incredibly joyful and thankful to be alive. I prepared the soup the night before and began with a simple blend of tomatoes, onions, hot peppers, ginger, and garlic. After the puree came to a simmer, I added diced potatoes and let them simmer until they were tender. The soup was as simple as that. Fufu is a starchy ball of dough, generally made from yams, cassava, plantains, or corn. Traditionally, the raw vegetables are pounded over and over with a pestle in a massive mortar until they develop into an elastic dough. The dough is then cooked in a large kettle, stirring constantly, until it all comes together into a large ball. Most American households do not have the right equipment to prepare the fufu this way; however, I found cassava powder in our local international spice store that is cooked in a large pot with water, stirring constantly until it reaches the same consistency. The texture was, as my friend stated, “like thick grainy mashed potatoes,” which for the most part makes sense, as cassava is closely related to potatoes. The fufu is served in the soup, and traditionally is picked apart with your hands and used as a utensil to eat your soup. 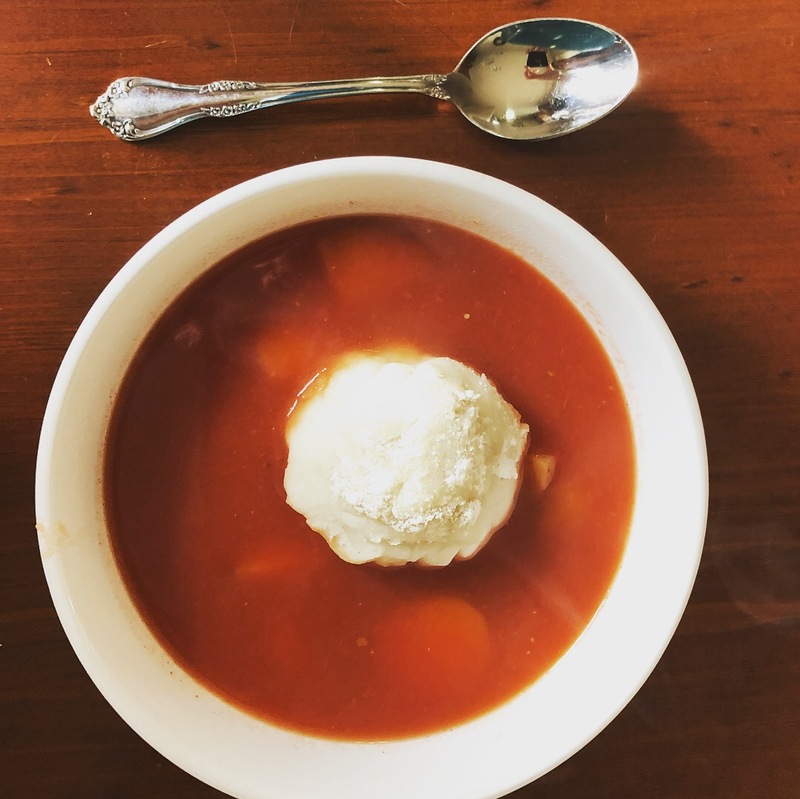 The verdict: The soup was light, full of flavor, and had a nice heat to it. The fufu is definitely different than starchy foods that I am used to eating, and while I am glad I took the time to make it, it is probably not something I would necessarily add to my usual diet. Mmmmmmmm, Red Red. 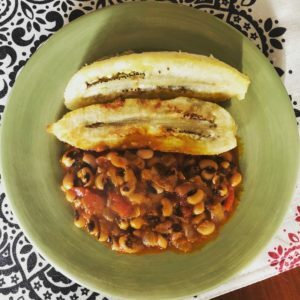 The two ingredients that make this dish unique and special are the black eyed peas and palm oil. To begin, I cleaned the black-eyes peas and let them soak overnight. Because I decided to use a slow cooker to prepare the Red Red, I simply combined all of the ingredients (black eyed peas, onions, brown sugar, palm oil, ground crayfish, salt, red bell peppers, plum tomatoes, scotch bonnet peppers, and garlic) into the vat and let it go low and slow for 6 hours. This allowed for me to have more time to focus on the other dishes that needed more attention. The verdict: Wow! It almost tasted exactly what we had in Ghana. 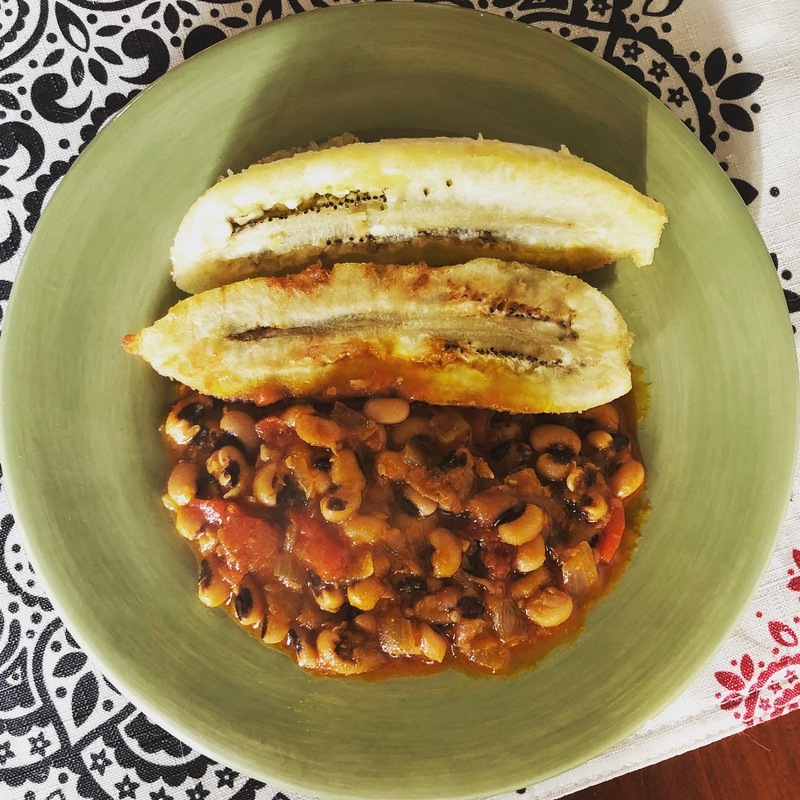 It is rich with bold flavors, but I need to work on perfecting the accompanying fried plantains. 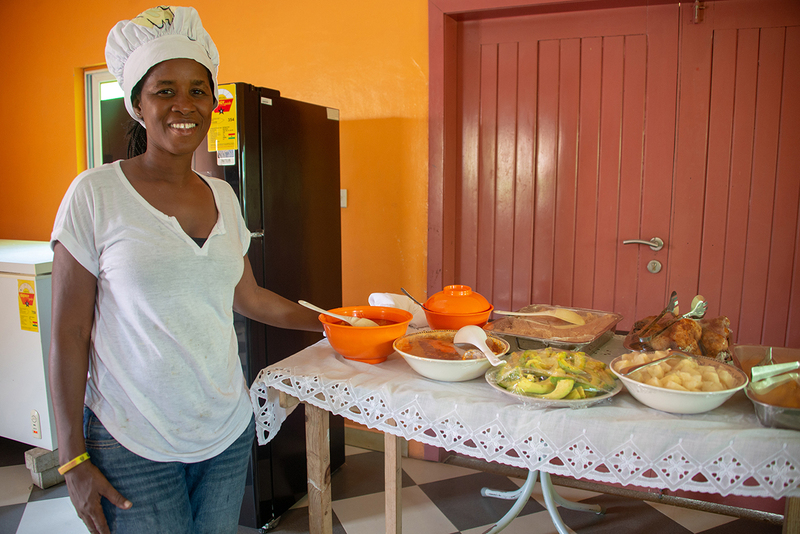 Evelyn, the cook at the care center, served a delicious tomato gravy with every lunch we had at the care center. Her gravy had such a distinct, perfect tomato flavor, which I assumed she had to have stewed for hours. The gravy I made did not have quite the depth of flavor that Evelyn’s did, but it was still delicious with the beef and pork kebabs. I seasoned the pork and beef with ground peanuts and other herbs and spices, seared them in a grill pan, and finished them in the oven. It was a nice finish to the meal, but we were so full that we were only able to tackle half of each of our kebabs. The verdict: Yum! I could definitely could eat this once a week and be completely satisfied. Roughly chop the tomatoes, onion, garlic, ginger, and peppers and place them all in a blender. Pulse until liquified. Pour the contents of the blender into a large pot. Add the water salt and pepper and bring to a rapid boil. When a boil is reached and a slight foam begins to form on top, add the potatoes and reduce the heat to a simmer. Let cook ten minutes. After ten minutes, add the cubed tilapia. Let cook for about ten minutes more or until the fish is opaque and cooked through. Cooke on low for 6 hours or high for 4 hours. Remove excess fat from meat, wipe with a clean damp cloth or paper towel and cut into bite-sized cubes. Mix all ingredients for seasoning together in a bowl. Combine the meat and half the seasoning and mix thoroughly. Stand for a minimum of 1 hour before grilling. Skewer the seasoned meat alternately with peppers and grill until cooked and browned both sides. Remove from the heat and sprinkle with the remaining peanut powder. On medium heat, add your oil into a deep pot and add your onions. Stir occasionally until softened. In a bowl, mix your water with the tomato puree and add to the onions along with your garlic and ginger. Let it cook for 10 minutes stirring occasionally. Add your canned tomatoes and the rest of the spice mix, apart from the bay leaf, to the pot. Let simmer for 25 minutes with the lid on, stirring occasionally to avoid burning. In the last 2 minutes, add bay leaf. 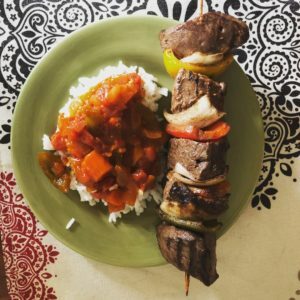 Serve over rice with kebabs.